Malignant mesothelioma is a rare form of cancer that affects the thin cell wall lining of the body's internal organs and structures. This lining is known as the mesothelium. 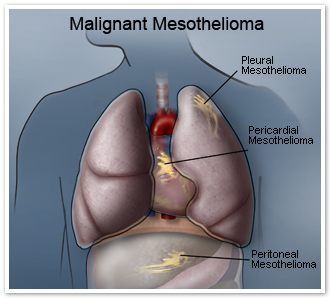 Malignant mesothelioma has three known varieties: malignant pleural mesothelioma, malignant pericardial mesothelioma, and malignant peritoneal mesothelioma. Pleural mesothelioma occurs in the pleura, the lung's lining. Peritoneal mesothelioma occurs in the peritoneum, the abdominal cavity wall. Pericardial mesothelioma occurs in the lining of the heart, known as the pericardium. Mesothelioma is known only to be caused by asbestos exposure. Asbestos is a natural, yet toxic, mineral that was frequently used across a wide variety of industries. Microscopic asbestos fibers enter the body via the lungs or by means of ingestion. Once inside the human body, the durable asbestos fibers are unable to be broken down or expelled, resulting in a harmful inflammation and scarring of the mesothelium. This scarring lays the groundwork for malignant mesothelioma and other respiratory conditions, such as asbestosis. There is a great deal of latency associated with asbestos exposure and the onset of mesothelioma. Patients often will not present with mesothelioma symptoms until 30-50 years following their exposure to asbestos. In many cases, those diagnosed with mesothelioma are not those who were directly exposed to asbestos in a jobsite setting. Spouses and children of those exposed to asbestos who frequently came into contact with the fibers on the clothing or person of those exposed have also developed malignant mesothelioma as a result. How is Malignant Mesothelioma Treated? Malignant mesothelioma prognosis is poor, as often the disease will be diagnosed in its later stages after symptoms have appeared. However, there are several treatment options for the management of this type of cancer. Among these are mesothelioma chemotherapy, radiation therapy, and surgical resection. Chemotherapeutic and radiation therapy methods are more common, but surgery is often an option for those whose disease is diagnosed early enough. More aggressive therapies are now possible for patients with mesothelioma diagnosed in its earlier stages. For instance, extrapleural pneumonectomy is now an option for many pleural mesothelioma patients who are deemed eligible for aggressive surgery. Extrapleural pneumonectomy involves the removal of the entire affected lung, the pericardium, the pleura, and the diaphragm. Patients who are eligible to receive an aggressive surgery, like an extrapleural pneumonectomy, will have a far more favorable prognosis than those diagnosed with advanced stage inoperable disease. However, there are treatment options for nearly all mesothelioma patients. Chemotherapy cocktails, such as the use of Alimta® in conjunction with Cisplatin, as well as numerous clinical trials being carried out, give mesothelioma patients the ability to slow the progression of the disease and extend survival rates. Malignant pleural mesothelioma is the most common type of mesothelioma and occurs in the mesothelial membrane surrounding the chest cavity and lungs. Pleural mesothelioma, because it is more common than other varieties of the malignancy, has had more research invested in it. Pleural mesothelioma represents approximately 70% of all mesothelioma diagnoses. Malignant peritoneal mesothelioma is less common than pleural mesothelioma and represents approximately 15-20% of all mesothelioma diagnoses. Peritoneal mesothelioma occurs in the lining of the abdominal cavity in the membrane surrounding the organs of this region. Like pleural mesothelioma, peritoneal mesothelioma is known only to be caused by exposure to asbestos. Malignant pericardial mesothelioma is among the rarest of all known malignancies, and represents less than 10% of all mesothelioma diagnoses. Pericardial mesotheliomas occur within the mesothelial lining of the heart. Pericardial mesotheliomas, like those of pleural and peritoneal varieties, are associated with asbestos exposure. Pericardial mesotheliomas differ from the pleural variant in that they are known to occur in younger individuals. While surgery is seen as the preferred method of treatment, mobidity and mortality are almost certain given the region in which the tumor is located. Malignant Mesothelioma will typically be suspected if the patient complains of chest pain, difficulty breathing, shortness of breath, chronic cough, or difficulty swallowing. While any of these could indicate mesothelioma, they are also associated with many other respiratory conditions so further diagnostic procedures are typically warranted before an accurate malignant mesothelioma diagnosis can be made. These may include imaging scans, such as computer topography or magnetic resonance imaging. A diagnostic biopsy is also required for cancer specialist to examine the behavior of these cells before a diagnosis is determined. Misdiagnosis is not uncommon in patients of the malignant mesothelioma, because the disease's symptoms so closely resemble those of other related conditions, including lung cancer, and other respiratory ailments. For this reason those who are at high-risk of mesothelioma (including those with asbestos history) should consult with physicians and cancer centers well versed in the treatment and diagnosis of malignant mesothelioma.